Si Passione, the fragrance for women by Giorgio Armani, unleashes the passion of the Si woman - empowered, feminine, and free. Si Passione is an intense, uncompromising scent for a confident woman willing to make extreme choices - a woman who dares to say yes. 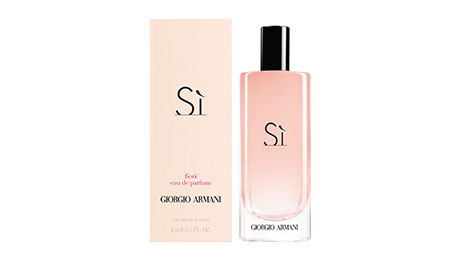 This fragrance is a powerful reinvention of this signature Armani fragrance, Si Passione adds a new dimension to Giorgio Armani's feminine fragrance personality - in his own words, "an irresistible combination of grace, strength and independence of spirit". Si Passione reiterates the keynote signature of Si - blackcurrant Jungle Essence nectar, combined with a sparkling, joyful pear. The new Si Passione fragrance combines intense vanilla with the blooms of rose, heliotrope and jasmine to create a sensual, fruity floral scent, reflective of the simultaneous delicacy and strength of femininity. At the very heart of Si Passione is cedarwood and the modern ambery-woody Orcanox , giving a maturity and character, mirroring a boldness of emotion, evoking true passion. The colour red is emblematic of Si Passione's attitude and essence. "Red as a sign of vitality, red as a signal of passion. Red to wish you good and punitiveness" says Giorgio Armani. Red is also the colour of passion and of love - passion that makes your heart beat faster.